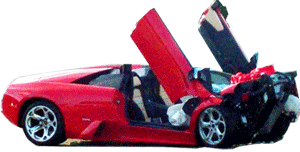 One thing we've never understood is how someone exits a Diablo after it flips over? The doors open vertically. Well, whoever wrecked this Lamborghini had to figure that one out.